The Authors of this book are Hunter Allen and Andrew Coggan PhD. Hunter Allen is an elite cycling coach, former professional cyclist and owner of the Peaks Coaching Group. Andrew Coggan is an exercise physiologist and author of numerous articles related to the application of the power meter data. The aim of the book is to introduce the power meter, its data and its applications to the cyclist who can then structure and execute their training programs in a professional and effective manner. With the power meter now available to the masses and not just the professional cyclist it is a matter of necessity that the universal concepts of its application be known to all. This is exactly what this book does. It explains the advantages and disadvantages in brief of most of the power meters on the market today. The book then explains in detail how the athlete should download, read and interoperate the information gathered on the meter after training. Athlete power profiling is one of the first tasks that the book deals with. It shows how the athlete should execute a test and determine their power profile from that test and then how to interoperate this information for the application of exercise prescription,. It will also explains fatigue profiling and how to structure training in order to eliminate those flat spots and build power. Once testing has been completed a detailed example of how to structure a training plan for a particular season and athlete is detailed. This is done for two individuals, one male masters rider and one female rider. This example and instruction has more than enough information for the rider to design and schedule out their own plan for the coming season. The book is loaded with graphs, charts, diagrams, equations and examples with detailed descriptions attached to each. Some might find this information a bit to heavy but if a professional structured training plan is what you want this is what you have to deal with otherwise pay a good coach who can read it for you. One of the main uses of the power meter that I find most coaches and riders not availing of it’s use for fatigue monitoring. In other words when a rider is approaching burn out or over training. This is not dealt with in this book. THe use of a power meter can also be used for obtain a better position of the bike with regard to power output, be it climbing, sprinting or timetrialling. 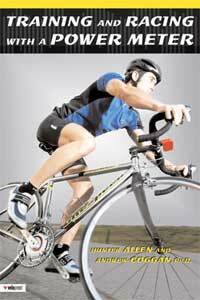 It can aslo be used for indoor and turbo sessions. The book also provides detail on these issues and many more. The book has in excess of 65 power based workouts and case studies for the rider to browse over. It also has an abbreviations index explaining TSS, MLSS, NP, and all those term some riders have heard but never understood. I you are thinking of buying a power meter I would suggest that you buy this book first and educate yourself on its application and nuances so as to convince yourself that power meter training is the way for you to train. Personally I am biased to the power meter as I do use a Wireless SRM + PCV 7 myself and my application of the power meter for 18 months was for injury recovery. I have only been back using the power meter for full competitive training for 6 months and have seen a 0% was of time on the bike and 100% use of recovery time. The first edition of this book is a great introduction if you are one who is not informed whatsoever regarding the power meter. 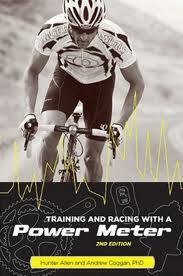 Although the book is 3/4 years old now it still holds the principles needed to start using a power meter. Teams using/used SRM include; HTC 2011, Astana 2012, Leopard/Trek 2012, Garmin 2012, Liquigas 2012, Omega 2012, BMC 2012, Skill 2011, NET APP 2011 and many more with other teams using other forms of power meters. The power meter is an essential part of any rider with hopes of turning pro. Educate your self with this book before you buy one. This entry was posted in Reviews and tagged 12 Week Winter Training Program, Cycling, Cycling Endurance exercise engineering Fatigue Profiling Heart Rate Monthly Testing Protocol Orthostatic Heart Rates Power sports and exercise engineering sports engineering Sports Exercise Engineerin, cycling training, E-Books, Endurance, ergometer training, exercise engineering, Fatigue Profiling, Heart Rate, Indoor Cycling, Max Power, Monthly Testing Protocol, Orthostatic Heart Rates, Test Protocol, Threshold, TT, VO2 Max, winter program. Bookmark the permalink.